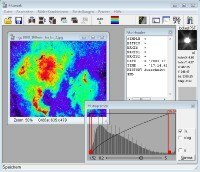 Fitswork is a windows image processing program, mainly designed for astronomic purposes. It contains batch processing, histogram functions, many filters, etc. Fitswork works entirely in floating-point arithmetic. folder and start the program by clicking on the exe file. dcrawfwxxx.zip file to the fitswork folder. If you encounter bugs, please send me an email in english or german with a brief description! Many thanks to all people helping me so far! and, of course, to Dave Coffin for the raw implementation (dcraw)! If you want to make another language for Fitswork, here are some instructions in english and german. Fitswork is freeware. Use the program at your own risk, i give no warranties!